Thu, Apr 25, 2019, 20:43:02 ---- The fact: 42.844.000 visitors done. 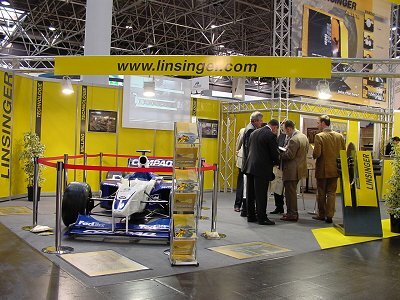 Company LINSINGER attracted great attention in the exhibition halls of the TUBE 2002 in Dusseldorf : not only with the professional outlined and realised Multimedia-Show, but especially with the exhibited BMW- Williams F1. The victory car shown on a tube fair for the first time made equally visitors and exhibitors blood boil. "We wanted to give a signal. We wanted to go beyond the normal presentation of our technology and bring to play the LINSINGER ideology." said Eng. Hans Knoll, Chairman and managing director. The relation to the Formular 1 is self-evident : Quick, precise, technical highly developed and sophisticated these attributes are not only valid for Formular 1 cars. The LINSINGER Circular saws and milling machines are also right in front even when highest requirements shall be met and highest cutting speeds be reached. "We had very interesting discussions with a number of international enduser of LINSINGER machines who visited our booth and expressed that the machines are operated to their greatest satisfaction." More than 90 % of the machines produced in the LINSINGER workshop are exported. Forging mills, Seamless Tube Mills, Automobile Industry and Shipyards are the main customers all around the world. The LINSINGER team goes steady ahead : Compared to the last year - Double number of orders and double turnover - a good-looking financial record. The tasks for the future are set : The further extension of the range of Turnkey Solutions is the established priority. Linsinger overtakes the complete design for turnkey solutions and supplies as main contractor turnkey lines - customer specific operator like everything from one hand.